It has a been a week since the SCBWI Winter Conference in NYC, and I am just getting around to unpacking my bag. What an overwhelmingly fantastic experience that was! I mean, most of the time the words “networking” and “socials” give me cold sweats, and I would be lying if I didn’t fess up to hiding in my room for at least one lunch. But that conference paid for itself before I even got there, it was so useful! In fact, I probably learned the most from the process of putting together a print portfolio for the Portfolio Showcase, which I haven’t done for an embarrassingly long time. Posting images on a website creates a really different experience than putting one image per page into a portfolio book. That book made crystal clear where my portfolio was strong and where there were gaping holes. How did I not notice before that so many of the characters in my portfolio images are standing or sitting and staring at stuff? Why are so many of the images from one book? Why is it that the work I am most proud of (my nonfiction picture book on genetics) translates into so few usable portfolio pieces? And why does so little of my humor come through in my portfolio? I came away determined to fill these holes and strengthen that book with more images where my personality comes through, images that tell richer stories, characters who engage with each other more actively. Somehow I assumed that since all my portfolio images come from books I have illustrated, they would be good examples of storytelling. But now I see the importance of including personal work in my portfolio as well, and creating images specifically for the portfolio. So, did I spend the past week creating new pieces and getting busy on my book dummy? Aaaaand therein lies the hard part. When I was at the conference (in a hotel connected to Grand Central so I never even had to go outside to get snacks, an eight hour drive away from my family and all the distractions both wonderful and frustrating that come with that) the big task at hand seemed like just making the right kind of work. But once back at home, daily life came flooding back and the big task became keeping a clear head and finding some uninterrupted time to make any kind of work at all. I have a notebook full of ideas that I had for new work on the long bus ride home. But where to begin? I have been flitting around this week, from trying to start using Twitter (rabbit hole) to getting back into posting daily sketches (a week has only one day, right?) to searching for local people to start a critique group (more accountability needed, and if there is the risk of running into group members at the grocery store, so much the better!) all while taking care of kids and remembering to feed them. So, the SCBWI conference didn’t sweep away my time management problems. But it sure did give me an inspiring kick in the pants! What did I learn once I got to the conference? 1. That there couldn't possibly be another industry out there filled with lovelier humans than the children’s book industry. Seriously, I feel so lucky to be part of this club. 2. All kinds of new digital illustration tools and time savers from a workshop with Dan Santat, Renee Kurilla, and Vashti Harrison. AND that I am more conversant in photoshop already than I gave myself credit for. 3. Really clear ways of thinking about what makes a great picture book story from a workshop with Connie Hsu, senior editor at Roaring Press Books. AND, in applying these measures to the picture book text I brought to revise, that I am on the right track. 4. That illustrators who create picture book biographies love research as much as I do, that everyone falls down the research rabbit hole, and that these are totally my people. Also, that they do a dizzying amount of drawing. I am completely in awe of Barbara McClintock and Eric Velasquez. 6. A super helpful analogy from editor Jill Santopolo for when rejection strikes, comparing shopping for a bridesmaids dress to an editor evaluating a manuscript. 7. That agents aren't looking for the next trend right now so much as they are for great stories told by all kinds of voices. 8. That my mom is a really fun roommate. Book your tix for next year, mama! I recently did a big family portrait for these two. Today they are curing cancer. Check out this research. Amazing people doing amazing science. Smarty Marty on shelves now! Last fall I illustrated my first chapter book, Smarty Marty Steps Up Her Game, by Amy Gutierrez, and...it released today! I really enjoyed this project. Despite the fact that I was born in Cooperstown, NY, home to the Baseball Hall of Fame, and I have several uncles and a grandfather who were serious about baseball, I went into this project knowing essentially nothing about baseball or softball, and the story required me to illustrate both convincingly. As a result, I spent an embarrassing amount of time watching YouTube videos of baseball and softball pitching and catching, and peppered my uncle (who happens to be a Little League coach) with inane questions when the internet let me down. One of my favorite things about being an illustrator is that with every project I have to give myself a crash course on some new topic I don't have a clue about so I can create illustrations that kids won't poke a zillion holes in right away. Kids are seriously the toughest critics, notice ALL your mistakes, and tell you all about them (in illustration and in life). Illustrating a chapter book, it turns out, is completely different from illustrating a picture book. With a picture book, the illustrations and the text work together as equal partners to create a story. For those projects I spend lots of time planning out all the illustrations in sequence to make sure they flow well from one to the next. And, all the picture books I have done so far have had full-color illustrations throughout. In other words, picture books are a ton of work. This chapter book, on the other hand, had a very quick turn around time, and the black and white illustrations were mostly vignettes as opposed to full page spreads. 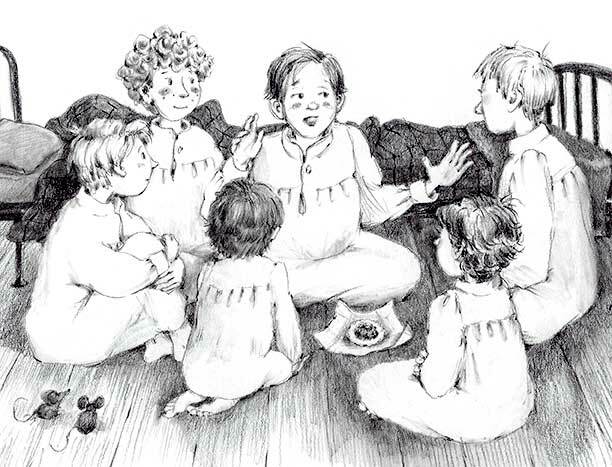 The illustrations in a chapter book don't really carry any of the weight of the story, they are decorative, and without them, the story would read just fine. Which means, for the illustrator, way less stress. You can now follow my daily sketching on Instagram, and please do! You'll find the good, the bad, and the ugly at arianakilloran_draws, or click the Instagram icon on this site. (Don't worry, this is an 'art only' account so you'll be spared the copious images of my kids on this one.) I have been looking for a place to put daily sketches, and this seems like the perfect home. With client work and kid wrangling and sandwich making and looking for misplaced phone/keys/gloves/whathaveyou the sketchbook doesn't always feel the love. But I am trying to find those elusive minutes and make some marks. So join me as I bumble along in my sketchbook, and maybe it will inspire you to squeeze in a doodle here and there as well! New interview and the official book release! I was interviewed over at the 23andMe blog about the making of The One and Only Me. Check it out here! And, the book had it's official release! You can read about how it fits into 23andMe's broader education program here. How did I not know about this trick??? You can now preorder The One and Only Me: A Book About Genes. Yay! Your kids can be the first on their block to discover the fascinating world of genetics. How cool will they be! Find your copy here.